About four years ago HarperCollins released a version of The Song of Fire and Ice in the Kindle Store which added audio and video. That edition is no longer available, but today Penguin has released a new edition of the ebook, this time as an iBooks exclusive. The $9 ebook features interactive character maps, detailed annotations, character journeys and timelines, house and sigil summaries, family trees and histories, and "stunning" illustrations. Enhanced editions of the later novels in the series will be released in the coming months. At present, A Clash of Kings will hit iBooks on 27 October, A Storm of Swords on 15 December, and A Feast for Crows and A Dance of Dragons in February and March 2017. 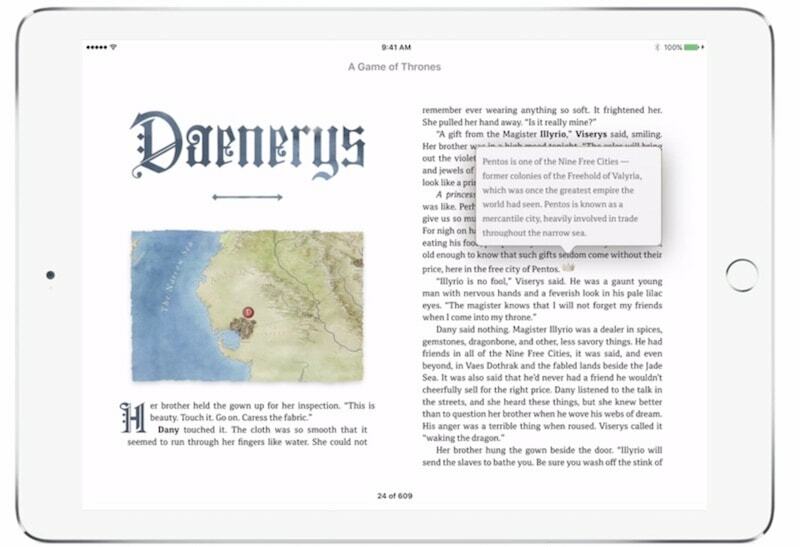 HarperCollins is only the latest publisher to take advantage of features exclusive to iBooks. Last October Pottermore published enhanced editions of the Harry Potter series in iBooks. They had little content which was new or improved over the original text, and were not worth buying; let's hope the enhanced Game of Thrones ebooks are better. The GRRM ebooks are infamous for having outrageously terrible OCR errors. It’s ridiculous that instead of fixing the numerous mistakes the publisher would come up with some stupid glitzy enhanced edition for iOS only instead.